Video-based healthcare consultation platform SeeDoc has raised around $1 million (around Rs 6.7 crore) in its pre-Series A round of funding led by early stage venture fund YourNest, Sunil Goyal, founder and CEO, YourNest Angel Fund told Techcircle. Goyal added that several other investors also participated in the round but declined to name them. 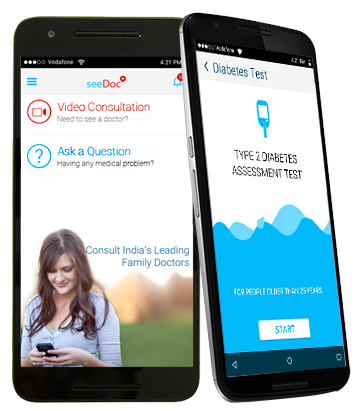 Gurgaon-based SeeDoc is an app-based online medical consultation platform which offers paid video consultation with doctors. Users can ask questions from doctors or opt for video consultation. It also allows users to get medicines delivered and diagnostic tests done at home, and keeps all medical records organised at one place. Users can also post a medical query on the app for free and get a response from specialists within 48 hours. The app claims to have more than six lakh users and processes roughly 500 video consultations daily. Healthone Technology Pvt. Ltd, which runs SeeDoc, was founded by two Silicon Valley entrepreneurs, Jaideep Singh and Vivek Bansal in 2015. In March it launched its video consultation platform. Bansal has done masters in computer science from Kansas State University and is also the founder of early stage investment firm, Plus Ventures. Singh, a management graduate from Wharton School, is also the co-founder of people search platform, Spock. The startup is also eyeing the offline market and has been partnering with leading labs and pharmacy chains such as SRL Diagnostics and Religare. Of late, firms in the healthcare technology space have been eliciting a lot of investor interest. Last month, Bangalore- and Coimbatore-based Orane Healthcare India Pvt. Ltd, which operates online doctor consultation platform icliniq, raised an undisclosed amount in angel funding from Erode-based laparoscopic surgeon Madhan Kumar Madathupalayam. In May ThingsMeet Solutions Pvt. Ltd, which owns soon-to-launch healthcare app Prescribez, has raised an undisclosed amount in seed funding from high net-worth individual and angel investor Ankush Mehta. In the same month, Doctor consultation app DocsApp secured seed investment of $1.2 million from investors led by Japanese venture capital firm Rebright Partners. Early Facebook investors Anand Rajaraman and Venky Harinarayan also invested in that round. In January, JustDoc, a healthcare startup that facilitates online video consultation with doctors, raised seed funding from former Infosys director TV Mohandas Pai, InMobi co-founder Mohit Saxena and other investors. In December 2015, Doctor Insta Pvt. Ltd had raised funding of $500,000. YourNest has earlier invested in Mycity4kids, Proof of Performance, Uniphore Software, Simpli5D Technologies, Bookmycab, GolfLan, BetaOut and Rubique.com. In April 2016, Fashalot, had raised an undisclosed amount of funding in its pre-Series A funding round, led by YourNest Angel Fund and angel investor Rajul Garg.